The Seattle Seahawks maintained their chances to be back at the Super Bowl for the third consecutive time in the Wild-card round. Paul Allen's team had to endure record cold temperatures in Minnesota. Temperatures were as low as -6 degrees. 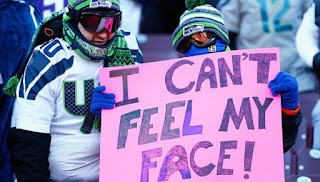 The game was the third coldest in NFL history. The coldest game was the so called Ice Bowl on December 31, 1967 in Green Bay. The Packers played against the Dallas Cowboys at -13 degrees. It is down to eight teams that have still a chance at the Super Bowl 50 on Feb. 7 in Santa Clara, California. See below the schedule for the Divisional playoffs and the conference championships.